With our brief stint in Liverpool having come to an end, we set off to more Northern climes, planning to cross the border at where else but the infamous Gretna. Before setting off from our Liverpool base, we nipped into the local M&S to pick up a selection from their incredible GF/DF range as well as some other bits and pieces for us to enjoy as a packed lunch whilst we were en route. There was just one more place for us to visit before our journey could properly begin as I insisted on a detour to Crosby Beach, home to Antony Gormley’s incredible art installation, Another Place. Mike and I had visited it during our previous trip, on a grey, wet and fairly miserable December afternoon and the weather wasn’t really all that difference on our second visit this March. The children found the statues themselves quite disconcerting and M wasn’t keen to get too up close and personal with any of them after he’d examined the first one. Whilst Mike and G wandered towards the shoreline to see the furthest one that was still accessible on foot, M and I instead stood back on the boardwalk to see how many we could spot out in the depths of the River Mersey. It is an impressive sight and was a detour I was glad we had taken. Unfortunately, the delays from both the shopping trip and our visit to the beach plus a late morning start meant that we hit traffic as we joined the M6 Northbound and we quickly found ourselves in the hell of bank holiday traffic and lengthy queues. Thankfully M slept his way through the worst of them and by the time he woke up, we had headed off-piste and were relying on my map-reading skills and the GPS on Mike’s phone to find short-cuts along A roads and through small towns to try to circumvent the M6 nightmare. We eventually found ourselves heading towards the Scottish border with a fast-approaching teatime and decided to stop in Gretna to have some food before continuing our journey to the next planned stop on our travels, Glasgow. We spotted the ever allergy-friendly Pizza Express at the Gretna outlet village and instantly decided it was the easiest place to stop as we know they can cater well for both children. The one thing that made me chuckle when choosing my dinner was spotting the Irn-bru – often described as Scotland’s second national drink – available on the drinks menu. As I said to Mike, “You know you’re in Scotland when…!” After an enjoyable and much-needed meal, during which I had explained the historical relevance of Gretna Green for young English couples looking to elope, we set off once again to complete the 90 miles or so remaining to reach our final destination. We arrived at our hotel on the banks of the River Clyde in the dark and were just about able to make our weary way to our room before bedding down for the night. It seems that endless queues of traffic can really take it out of you! This entry was posted in Chronic Illness, Family, Travels and tagged Allergy, Another Place, Antony Gormley, art installation, Awareness, Dairy free, Easter, eating out, family, Food, food allergies, gluten-free, Gluten-free diet, Gretna, Gretna Green, holidays, Irn-bru, Liverpool, parenting, Pizza Express, Special Diets, statues, stress free travelling on May 7, 2018 by bluesingingdragon. The Galleon Inn, Fowey – this harbourside pub in Fowey gives generous servings of delicious pub grub and features fish and seafood on both their a la carte menu and their specials board. They were able to serve safe chicken, cucumber and peas (his food challenge for the week) for M and, whilst it wasn’t clear what their other free from offerings were, we were able to order gammon, chips and peas for G, which she loved. Although the staff were friendly and helpful, we couldn’t clarify that the chips were 100% GF, so for anyone who struggles with cross-contamination issues, I would suggest ordering a different side. Pizza Express, Falmouth – we visited the brilliant National Maritime Museum in Falmouth with G’s lovely Godmama and her family and were able to eat lunch at the Pizza Express situated across the square. We were able to order our usual allergy-friendly fare here and although the service was disappointingly slow and the food not quite as good as at our local Pizza Express, we were still happy with the meal we had. 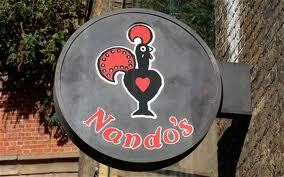 A definite go-to in terms of national chain restaurants when looking for somewhere safe to eat. Eden Project, Bodelva – following my perusal of their website and an email exchange with a very helpful customer liaison co-ordinator, we had gone well prepared with a packed lunch and range of suitable snacks for both G and M and I’m definitely glad we did. 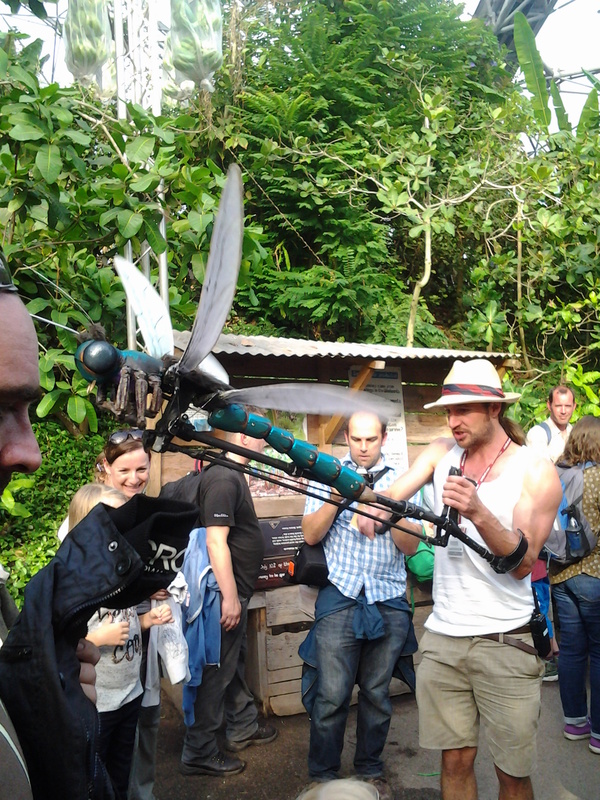 The queues in the main cafe area in the biomes were horrendously long and their staff disappointingly uninterested in speeding things up to try to reduce the waiting time. Mike and I enjoyed our tortillas and the server I spoke to advised that it was possible to adapt some menu items to be both gluten- and dairy-free and I struggled to find any snacks that were readily available and obviously allergy-friendly. Given how long we did wait (close to 25 minutes for a mid-morning coffee and snack! ), I’m glad we weren’t dependent on that to feed G. We loved our visit, but were disappointed by the food on offer and would take food for us all the next time. 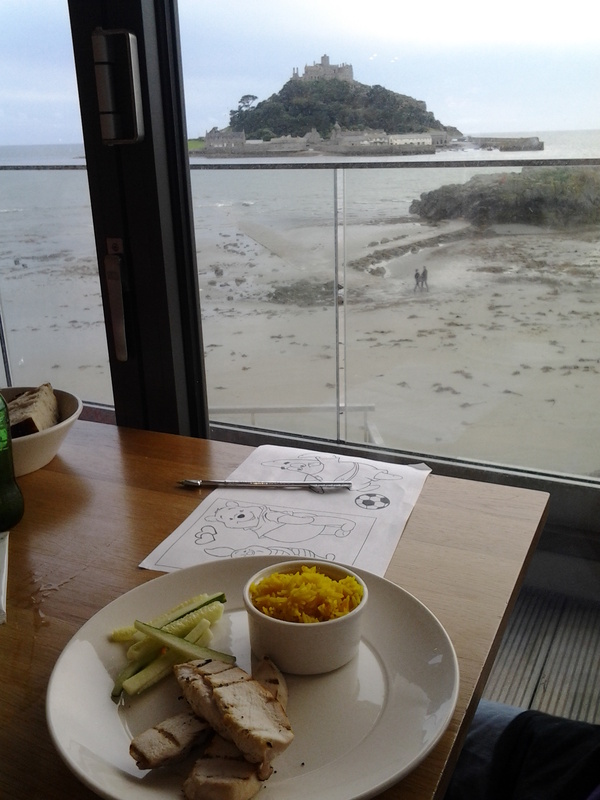 Tate St Ives – this was the surprise success story of the week for G and we even managed an unexpected treat for M too. They had comprehensive allergen information readily available and were able to offer all of their sandwiches on GF bread. G was so thrilled, she ordered an egg mayonnaise sandwich with a helping of GF chips on the side and enjoyed every mouthful. I spotted cucumber sorbet on their dessert menu as part of a Pimms jelly extravaganza and asked if they knew what it contained. The answer quickly came back from the chef that it was safe and so we were all able to enjoy a pudding. G had an orange and polenta cake that barely touched the sides as it went down and M had a couple of inquisitive mouthfuls of cucumber sorbet, although his final conclusion was that he’s not keen to try it *ever* again! Sams, Fowey – part of a popular Cornish “chain”, perhaps best known for Sam’s on the Beach, we visited their Fowey restaurant, which I can best describe as a Cornish version of the Hard Rock Cafe! 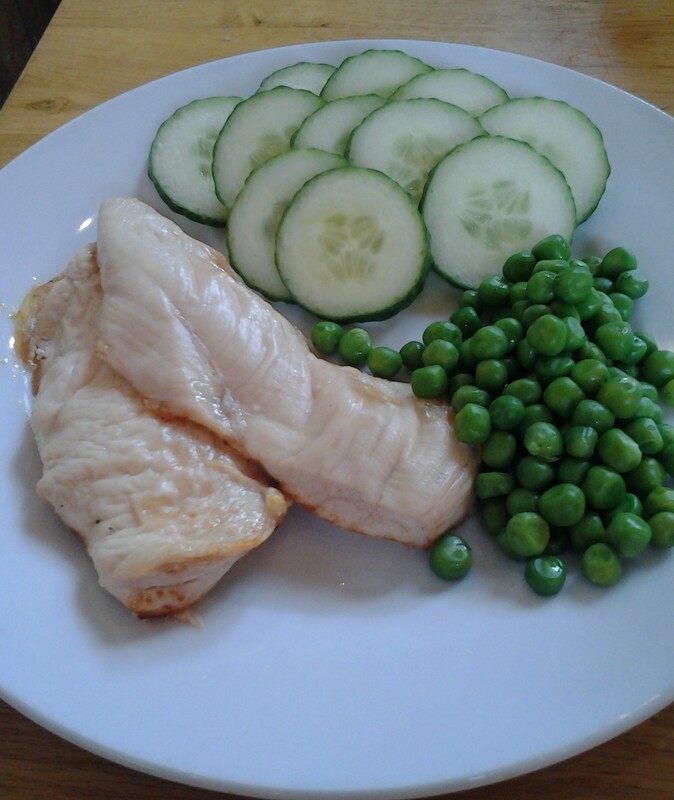 Once again, they were able to cook M-friendly chicken and cucumber, whilst G enjoyed fish and chips. Their system of no booking ahead meant we had almost an hour wait for our food, but we spent it upstairs in the bar area and the time just flew by. I am not 100% certain of just how safe G’s food was, but am reliably informed that their Polkerris location can cook a mean gluten- and dairy-free pizza, an adventure for another time for us. The Godolphin Arms, Marazion – our day out to visit St Michael’s Mount ended with a table overlooking the Mount as the sun set and we enjoyed our dinner. I knew that this restaurant could provide GF offerings, thanks to this great blog and the opportunity to give it a go and enjoy the spectacular view was too good to miss. M enjoyed a more complete dinner here as they were able to prepare rice, chicken and cucumber for him and G picked the GF burger and chips. We received great service even though the restaurant was busy, but had a disappointing cross-contamination risk during dessert. Our request for lemon sorbet for M was met, but unfortunately, once he was half-way through his bowl, we discovered traces of a red sorbet mixed in with the lemon. 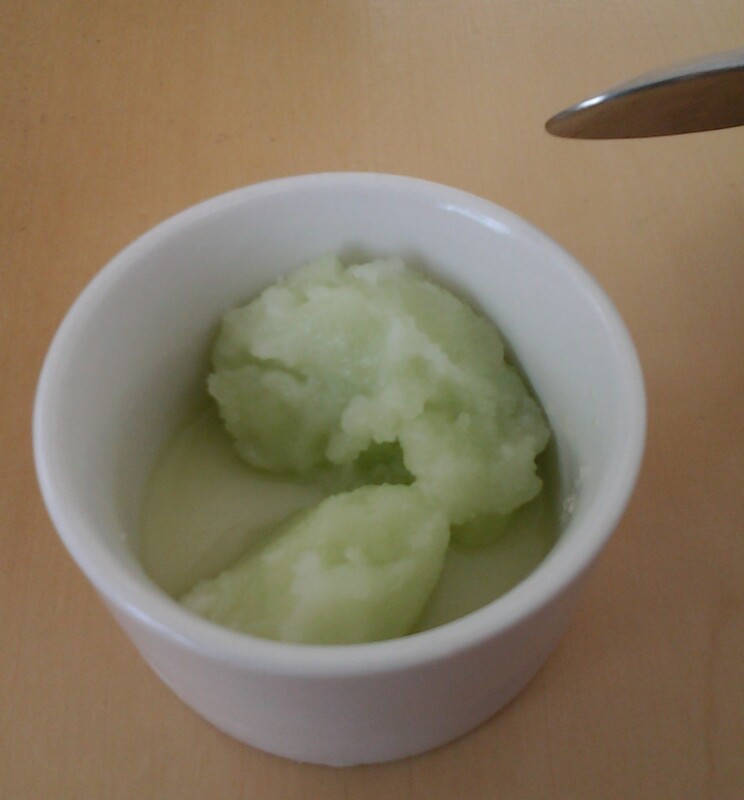 It was immediately obvious that the kitchen staff had used the same scoop to serve his lemon sorbet, even though the serving staff had made every effort to ensure that the sorbet was safe for him. Our waiter was extremely apologetic, was very concerned about the cross-contamination risk to M, who fortunately hadn’t eaten any of the other flavour when he spotted it and spoke to the manager to ensure that the kitchen staff were reminded to be vigilant with the allergy-friendly meals. The Malt House Harvester restaurant, Exeter – I’d been wanting to give the Harvester restaurants a try for a while and our return home gave us such an opportunity. I love the salad cart that’s available and knowing that both rice and chicken are almost staples to the menu, I felt confident that it could work. On announcing our allergy requirements on arrival, I was handed a massive and somewhat unwieldy ring binder containing their allergen information, which took me a good 10 minutes to navigate. I eventually was reassured that the chargrilled chicken breast would be fine for M and he was able to have basmati rice and cucumber to accompany it. G picked the baby back ribs with chips which appeared to be both GF and DF and enjoyed selecting her salad from the cart. The ordering process may have taken a little long due to the complexity of their allergen information, but the meals at the end made it all worthwhile. This entry was posted in Chronic Illness, Family, Food Allergies, Travels and tagged Allergy, Anglo-Saxon houses, Awareness, Cornwall, Dairy free, eating out, Eden Project, Falmouth, family, Food, food allergies, friends, gluten-free, Gluten-free diet, Godolphin Arms, Harvester restaurants, holidays, Malt House Exeter, Malt House Harvester, Marazion, National Maritime Museum Cornwall, parenting, Pizza Express, PizzaExpress, Sams Fowey, Special Diets, St Michaels Mount, summer, Tate Gallery, Tate St Ives, The Galleon Inn Fowey, tube feeding, wheat free on September 7, 2015 by bluesingingdragon. WOW! Haven’t things changed since we were young? Way back when, I remember the school trips from my Junior school years. They always seemed to be to places of historical importance or museums and not necessarily to the places my friends and I would have chosen for a day off school. 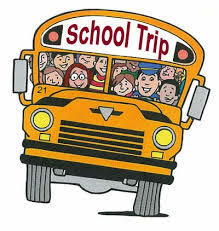 As I got older, the trips involved a little more travel and even, very, very occasionally, a theatre trip, or suchlike, that required additional financial input from willing parents. These days school trips appear to have changed dramatically or, at least, that appears to be the case this term for my pair. They appear to be far more exciting than any school day out that I remember. M’ school trip happened a couple of weeks ago and, as it fell on a day I didn’t have to work, I tagged along for the ride. The day itself was grey, wet and miserable, but that didn’t seem to dampen the spirits of the 27 7- and 8-year olds going out for the trip. We clambered aboard the bus and off we set, amongst much discussion of just how long it would take for us to reach our destination. Fortunately, a mere 20 minutes later we arrived, disembarked and were ready for the next 2 hours. Our location? 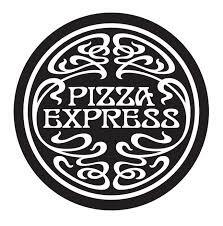 Pizza Express! 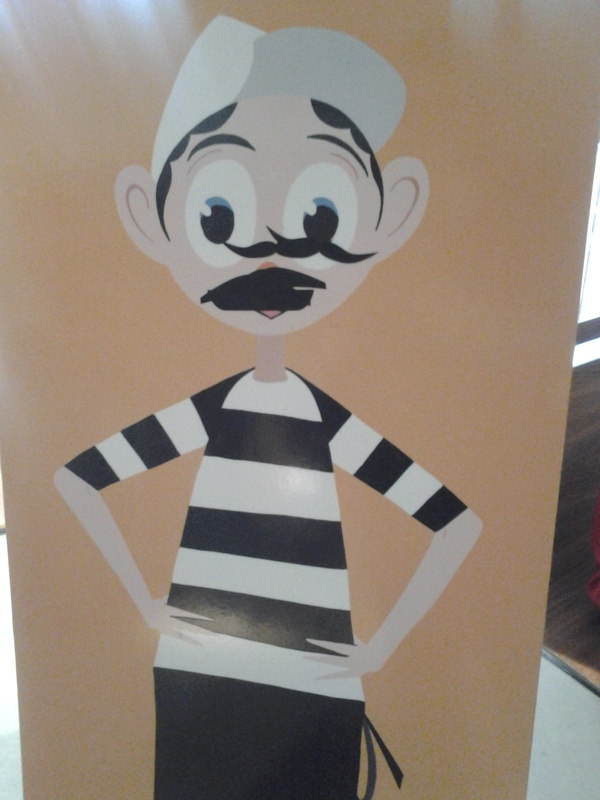 Last year, Pizza Express teamed up with the Children’s Food Trust to encourage children to get cooking. They offer free visits to schools, where the classes are taught about the provenance of the food they eat, learn basic health and safety in the kitchen and have the opportunity to make their own pizza to enjoy. What was even better, from my point of view at least, is that Pizza Express offers an excellent experience for food-allergy sufferers, which meant that M was able to participate fully on the day itself. 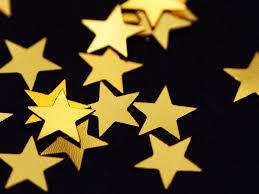 They started with a tour of the kitchens and a quick step into the enormous fridges – if they dared. We saw the pizza ovens, where we were told that a pizza takes no more than 4 minutes to cook, which certainly left us adults scratching our heads and wondering quite why it takes so much longer when you’re waiting at your table! This was followed by a food-based quiz, where 1 of M’s classmates impressed me by being able to identify oregano just from a photo and the children were able to taste, if they wanted, some of the ingredients they would be using later. Next, the pizza chef on site prepared from scratch one of the most popular pizzas, cooked it and offered a slice to everyone there. Finally, as every child was now nearly at bursting point, they were sent to wash their hands thoroughly before starting to prepare their pizzas. An impressive array of ingredients was set out on the tables, enough to satisfy even the most picky of eaters, without overwhelming them with choice. Pizza bases were passed along the lines and the restaurant manager made certain that M’s gluten-free base was on its own tray to avoid the risk of any cross-contamination. 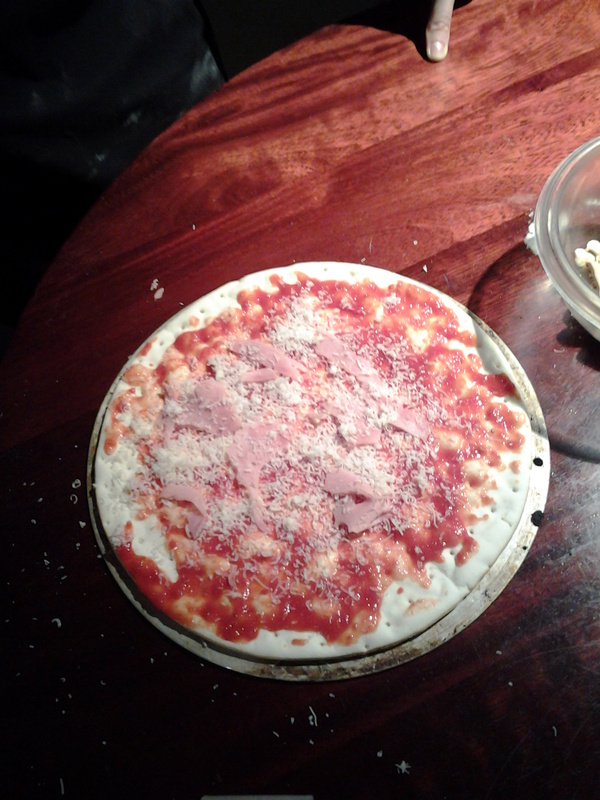 M was given his own spoon and first go at the tomato sauce, so I was confident that his pizza would remain “safe”. Every Pizza Express restaurant has a reference folder which shows every ingredient used in their recipes and indicates what allergens each contains. I was confident that the pepperoni provided was M-friendly, but it was fantastic to be able to check so easily and without fuss. I had prepared some slices of our newly discovered Violife cheese too, which meant M could finally have a pizza with cheese, rather than without which has so often been the case. M stood happily with his friends, laughing and chatting as they each designed their idea of the perfect pizza. 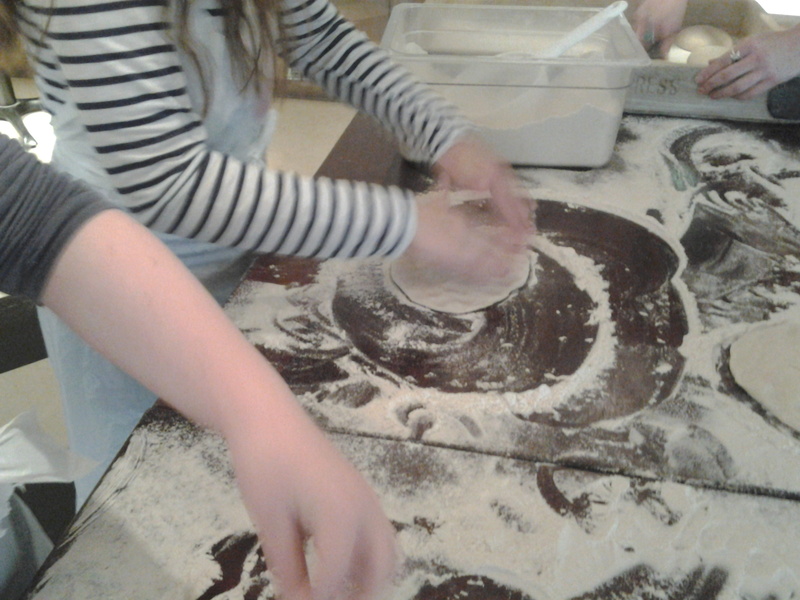 Once the pizzas were made, including those of all the teaching staff and parent helpers present, they were popped into the massive ovens to bake. As soon as they were ready, they were placed into individual takeaway boxes for transporting back to school and each box carefully labelled with each child’s name. 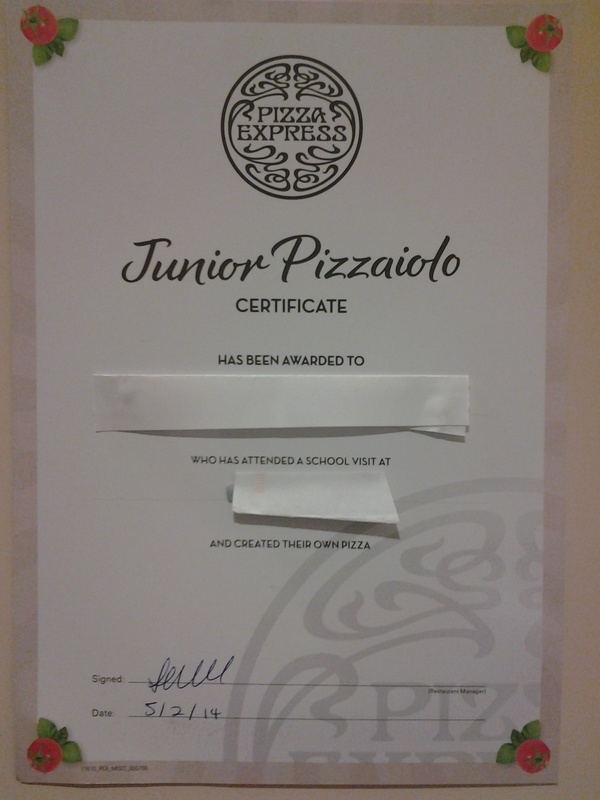 All the hard work done, it was back to the coach and to school, ready for a pizza lunch. It was great morning out and once again my heartfelt thanks go to Pizza Express for ensuring it was an experience that M could share in too, despite the multiple food allergies. Not only do they provide great ingredients and plenty of allergen information, but they are clearly conscious of the risks of cross-contamination for food-allergy sufferers and work hard to ensure those are minimised as much as possible. I was impressed with the birthday party we had there for G and equally so that time and care was taken to make sure that this school trip was 100% successful too. I have no idea what trip is planned next, but I suspect it will take a lot to beat this one! This entry was posted in General and tagged Allergy, Birthday, Dairy free, eating out, Egg free, Food, food allergies, gluten-free, Gluten-free diet, pizza, Pizza Express, PizzaExpress, school, Soya free, Special Diets, wheat free on February 25, 2014 by bluesingingdragon. The first day of December heralds the start of the busy season for most, but an especially hectic time in our household. As well as the much-awaited day itself with all the associated celebrations at school, work, choir and church, we also have to fit in a 10th birthday and a wedding anniversary. This weekend we got the ball rolling in fine fashion with an early birthday celebration for G.
Whilst G is most definitely a December baby, this year other commitments near her birthday led to my decision to throw her party early and sneak it in at the end of November instead. The first discussion was about the format her party was going to take. G was keen to combine cooking or baking with a sleep-over. I was less keen. The prospect of organising a group of near 10 year-olds (and two 7 year-old boys) to prepare, cook and possibly decorate a selection of M-friendly foods lacked appeal. Add in M’s inability to settle and sleep at the moment and I could see that it was more likely that full-scale battle would break out, rather than the joyous birthday celebrations G had in mind. 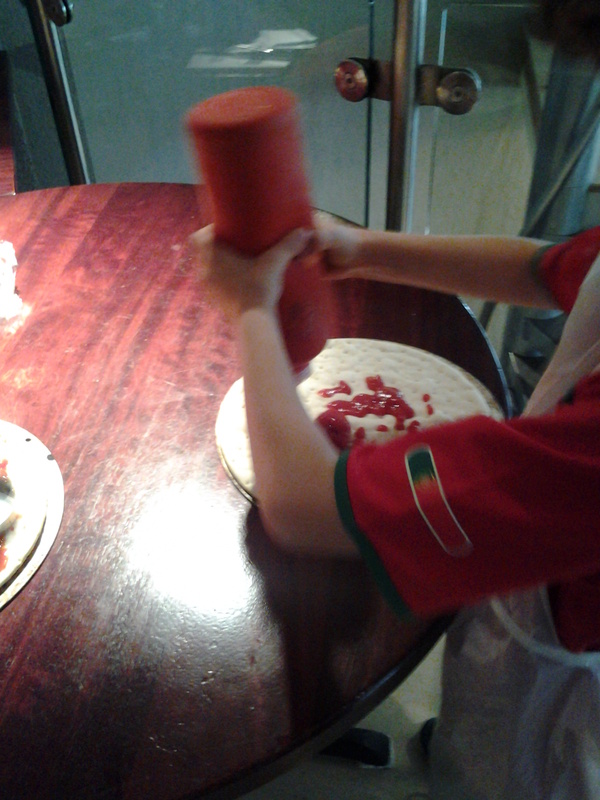 Thanks to some wise words from Canadian friend F, I found the perfect solution – a pizza-making party at Pizza Express. Now I appreciate that throwing a pizza party for a child with wheat- and dairy-intolerances and her multiple food-allergy suffering younger brother sounds somewhat off the wall, but thanks to the gluten-free menu introduced by Pizza Express earlier this year, we knew it was a viable option. We discussed our requirements with our local restaurant and were reassured that both children could participate fully and work around their dietary restrictions. The date was duly booked, invites sent, travel arrangements made and finally the day dawned. Following our prompt arrival at the restaurant, each child was given an apron and hat to don before their starters of garlic dough balls and a side salad were served. Thanks to the information provided by Pizza Express, I was fully equipped for all eventualities and the chef was able to lightly toast 4 slices of M-friendly bread, which was served with garlic butter that I had prepared at home. 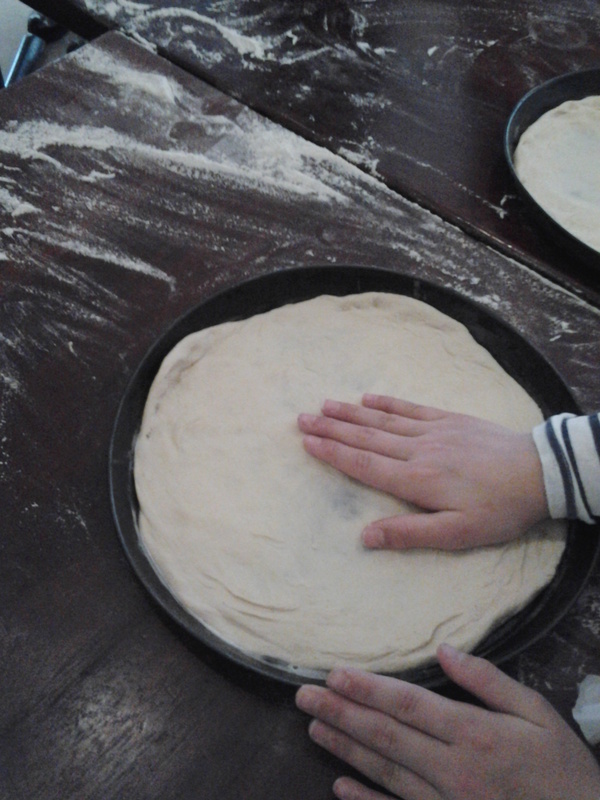 Next the task of making the pizzas themselves. G, M and their friends were given a ball of pizza dough each and were then instructed in the art of rolling, pressing out and filling the pizza pans. The children had varying success with their pizza bases, but eventually, after a couple of false starts, everyone had a base to be proud of. 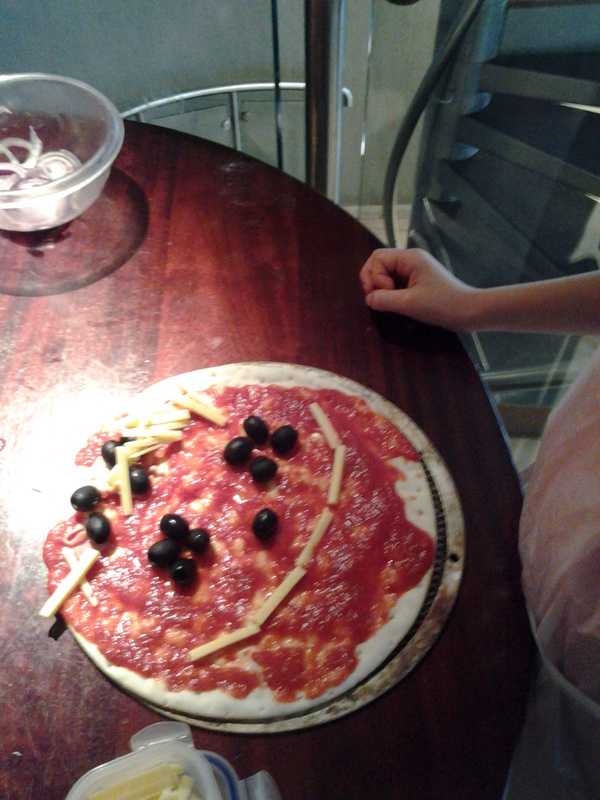 They were then given a selection of toppings to add before their pizzas were baked in the ovens. G and M were able to take full part in this, preparing pizzas for Mike and me to enjoy. 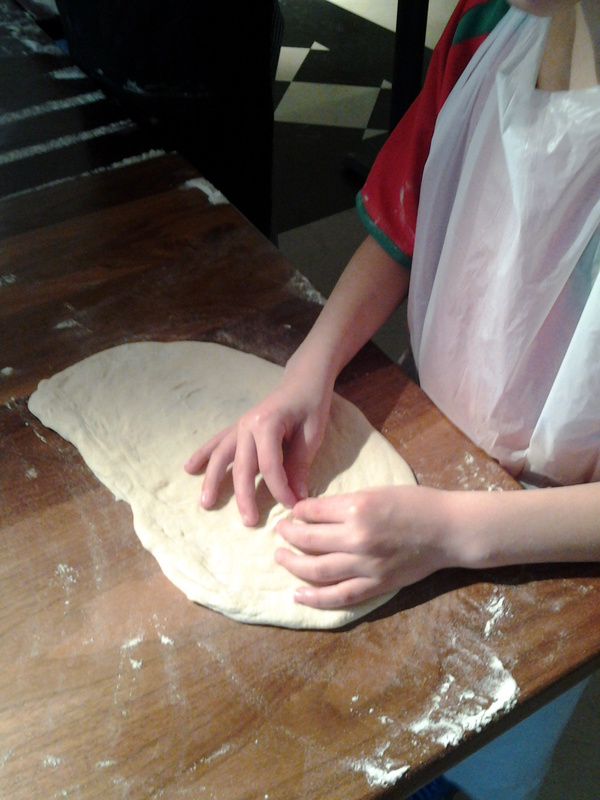 Once these pizzas were ready to be cooked, G and M were then given the opportunity to make their own lunch. Our party host was fantastic and explained just how Pizza Express make sure that their GF options are kept safe from the risk of cross-contamination in their kitchens. The GF pizza bases are pre-made and kept in separate storage as is the GF tomato sauce for the base and they use different pizza pans to cook the GF pizzas, which are easily distinguished from the normal ones. I had brought our own supplies of grated goats’ cheese for G and chunks of Violife vegan cheese for M, which is both dairy- and soya-free. We finished the meal with a small portion of ice-cream with various toppings they could add at their discretion. Once again I had been able to bring with me a tub of Booja-booja chocolate ice-cream for G and M to enjoy and was thrilled to discover that the Pizza Express toffee sauce was safe for them too as the party host had made the effort to check the detailed allergy listing for all their products and could reassure me that it was safe. 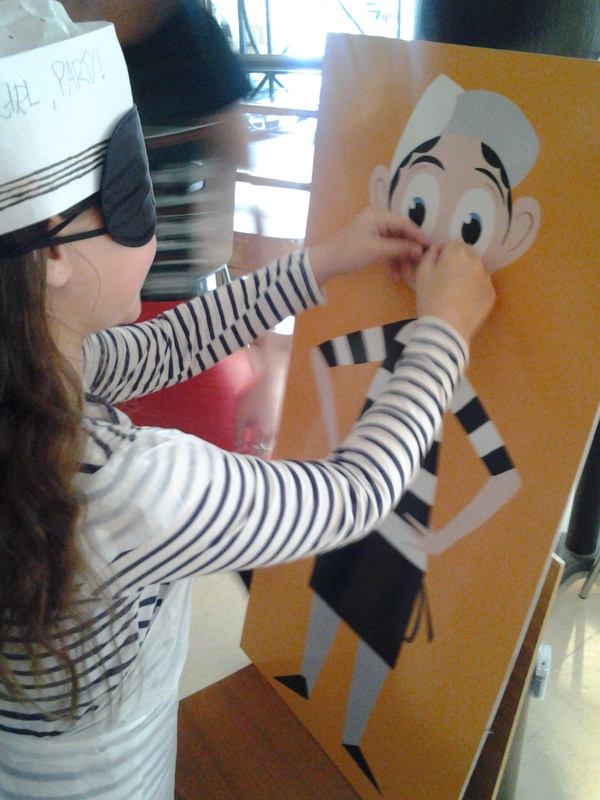 All the children had a wonderful time and we were hugely impressed by the attention to detail that PIzza Express makes to ensure that their allergy-friendly options remain safe, even down to serving G and M’s pizza on separate platters to once again ensure no cross-contamination occurred. It was a real treat to be able to offer a “normal” birthday experience to G and for them both to enjoy the birthday celebrations with their friends. This entry was posted in General and tagged allergic reaction, Allergy, Awareness, Baking, Birthday, Conditions and Diseases, Dairy free, Dyspraxia, eating out, Egg free, Food, food allergies, gluten-free, Gluten-free diet, health issues, home cooking, parenting, Pizza Express, PizzaExpress, Sleep, Soya free, wheat free on December 2, 2013 by bluesingingdragon. Unsurprisingly, when you’re having to work with any number of food allergies, it becomes a minefield to negotiate when considering going out for a meal. As food allergies appear to become more prevalent in our society, more and more of the larger restaurant chains are becoming aware of the need to make provision and adapt their menus to suit a wider audience. Charities such as Coeliac UK provide their members with a list of “safe” restaurants to eat and offer advice as to what to do when going out for a meal. For many families like ours, even this information is not enough to guarantee that we can eat out safely. M is our hyper-sensitive, multiple food allergy suffering stumbling block to overcome when we consider eating away from home. One piece of luck we do have on our side is that M is a complete and utter foodie. He loves food and is prepared to try almost anything at least once, unlike his big sister, who has become increasingly fussy the older she gets. He particularly enjoys eating seafood and fish, though he will readily admit that oysters are not a favourite! And yes, he has tried them, but found them a little too salty for his taste. However, we have been lucky enough to find a small handful of restaurants that do cater to our needs and that don’t appear to cause a negative reaction in M. There is no guarantee that these would suit everyone with food allergies, but they may be worth a go. I would highly recommend contacting the restaurant before your visit to check whether they can confirm if they can accommodate your specific food allergies, taking a look on-line at their allergy-friendly menus and we have found the Dietetics team at GOSH to be extremely knowledgeable too. Nando’s: Whilst there are obvious foods that M can’t eat (the wraps, rolls and breads for a start), the chicken is gluten and wheat free and, so far, M seems able to tolerate the chips. What’s more, if you’re at all anxious about what the individual ingredients are, each Nando’s restaurant has a Food and Menu specifications book which is readily available. M loves visiting Nando’s, not least because the children’s menu includes a M-friendly ice lolly as an alternative to the frozen yoghurt offered for dessert. 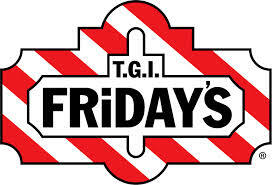 TGI Friday’s have their “Five Easy Pieces” menu, which provides meal options for those suffering from a gluten or lactose intolerance and includes a child specific selection. M has enjoyed the steak, the chicken tenders and the hot dog without problem, though it is possible that the hot dog contains soya. Unfortunately, they are yet to provide any dessert that suits those who struggle with food allergies, but the main courses tend to be large enough to satisfy most appetites in my experience. We only recently discovered that Bella Italia has a gluten free option on their menus and have been incredibly impressed with the level of service we’ve had when eating there with M. He chose a gluten-free pizza base, which the manager confirmed was also soya-, dairy- and egg-free, and topped it with their tomato sauce, ham and olives. M was in seventh heaven when we discovered this treat and is desperate to go back with the rest of the family in tow. They also do gluten-free pasta, though we have yet to try that out and were able to provide 2 alternatives for dessert – sorbet or M-friendly ice lolly. The latest restaurant to jump onto the gluten-free bandwagon is Pizza Express. Their gluten-free menu went live on 1 May 2013 and they have now updated the information to detail which ingredients on their menu should be avoided because they also contain gluten. We tried Pizza Express out with the children last weekend when we were at the Allergy Show and were again impressed with the pizzas that arrived. However, they did mess up the order a little by forgetting to add G’s goat’s cheese on her pizza, but otherwise we were impressed with the meal. Sadly, another without a dessert that suits those with multiple food allergies and M insists that the Bella Italia pizza was far better and bigger. There are very many local or specialist restaurants out there who will also accommodate the most complex of dietary needs, but these should be a good starting point for anyone with children with food allergies. A word of caution to add, these restaurants are not able to guarantee that no cross-contamination will occur within their kitchens, though they work hard to make sure the risk is a minimal as possible. We have found that by talking to the waiting staff and explaining our needs, we get the best service we could ask for and I would recommend asking them what they can do to make your eating out experience the best one possible. This entry was posted in General and tagged allergic reaction, Allergy, Bella Italia, Coeliac UK, eating out, Food, food allergies, gluten-free, Gluten-free diet, Nando, parenting, Pizza Express, Special Diets, TGI Fridays on June 13, 2013 by bluesingingdragon.